You clicked on the "I'm New" button! Thanks for taking the time to check us out. We have created this page to eliminate as much of the unknown as possible. If you still have questions simply email nwcoc@nwcoc.org and we'll be happy to answer your questions. In everything we do we believe in guiding others into a deeper relationship with God. Northwest is a diverse community of all generations that inspires others to follow Christ. We inspire followers by placing biblical understanding and positive relationships on center-stage allowing everyone to sharpen and be sharpened by one another. Northwest is an authentic and positive place. We believe that we have so much to celebrate because of what God has done in our lives. We are not a judgmental church. We know that we are reliant upon God for forgiveness, and He is our only means of salvation. We could be described as a relaxed and casual group of people who are excited and passionate about worshiping & serving God. We know how incredible and rare it is to receive acceptance and forgiveness when it is undeserved. We appreciate how Jesus' sinless shoulders took the weight of our dark mistakes so that God could see us not as enemies worthy of his punishment, but as His Children worthy of his love, protection, forgiveness, and grace. We exist to worship God and share the message about a God who is capable of that kind of love. We want you to feel welcome to attend any event that Northwest has scheduled. Whether it's a Bible class, a Life Group, or a Family Weekend, we want to encourage you to come and connect with the Northwest family. Visitors have a standing invitation and are always welcome. One of the things you will notice on your first Sunday is that we sing without musical instruments in worship. We find there is something beautiful and simple about each person pouring their heart out to God in worship without the distraction and the complexity that can come with other styles of worship. One of the things that is important to Northwest is to help those wanting to connect with God find the relationship they have been looking for. Email nwcoc@nwcoc.org if you are interested in finding out more about our individual studies. In Faith City the Bible comes to life through hands on experiences. Children have the opportunity to engage all their senses while experiencing the Bible in one of four distinct classrooms each week: Theatre, Diner, Park, and Museum. Faith City is open every Sunday morning during Bible class. Doors open at 9:00, and class starts at 9:15 and again Wednesday night at 7:00 pm. CLICK HERE to discover our main entrance, where to park, where and what building to enter when you arrive on campus. 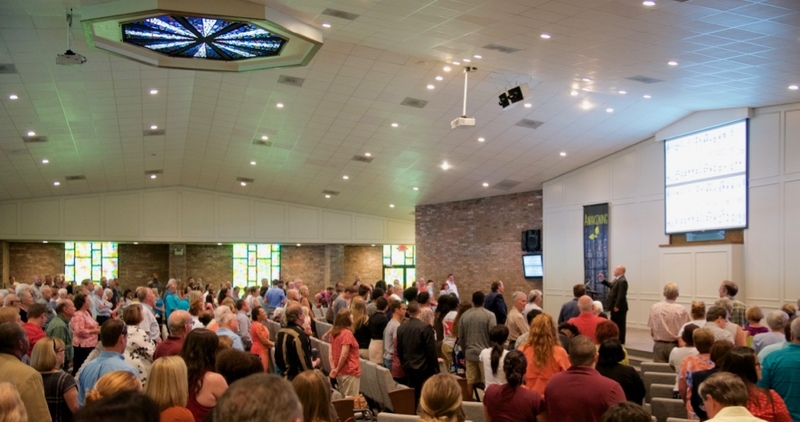 Click the image below to view a gallery of our buildings, worship center, classrooms, Faith City, teen center and playground.